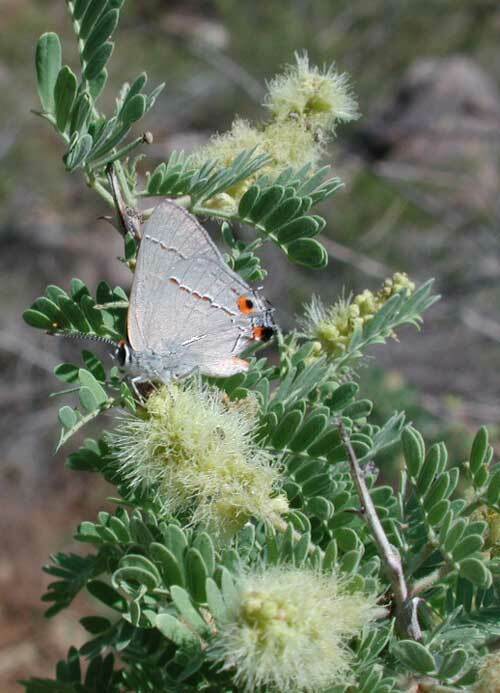 This gray hairstreak is taking nectar from the flowers of Catclaw Acacia (Acacia greggii). It was photographed on June 5th, 2005 at the Gilbert Riparian Preserve, Gilbert, Arizona. This is a common insect across much of the North America as well as the Sonoran Desert. Across this range there are many named sub-varieties. The slug-like caterpillars feed on a variety of plant leaves including members of the bean family. In the Sonoran Desert males engage in the behavior known as hilltopping. At the tops of knolls and small mountains males will set up and defend territories centered around a tree or shrub. Invading male Gray Hairstreaks will be challenged and buffeted away. Female hairstreaks on the other hand only ascend such a hill soon after emerging from their chrysalis and when they are ready to mate. The female chooses a male from a prominent territory. This method serves as a proxy for her to select the fittest male. Why a hilltop? Possibly because in a desert environment these butterflies may be very scarce and the hilltop serves to gather widely dispersed individuals.